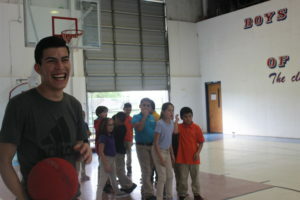 Shown are children and staff member laughing and playing after school at the Boys & Girls Club. The San Benito Boys & Girls Club is back under new management and operations, ready to service the community and children in the most inclusive and wide-ranging way possible. With funds secure and new programs at the helm, the Club hopes to create a revamped version of the facility and the atmosphere within. The Boys & Girls Club of San Benito first welcomed children back in 1976. According to the club’s website, the institution promotes youth guidance through educational, vocational, recreational, social and character development of boys and girls ages five through 18. They also manage an after school program five days a week, as well as a summer program from June to August which also runs five days a week. Earlier this year, and after applying twice, the Club was the recipient of the Legacy Grant awarded by the Valley Baptist Legacy Foundation for the amount of $150,000. Liz Chavez, the Boys & Girls Club board president says the funds are being invested directly towards gym renovations, with additional funds from the city being directed towards restroom renovations and recreational equipment, such as balls, nets, etc. The Club was also distributed $15,000 from the Community Development Block Grant funds earlier this summer. Any news of the skate park that they promised to build? (I mean a real skate park), we’ve been waiting for years!